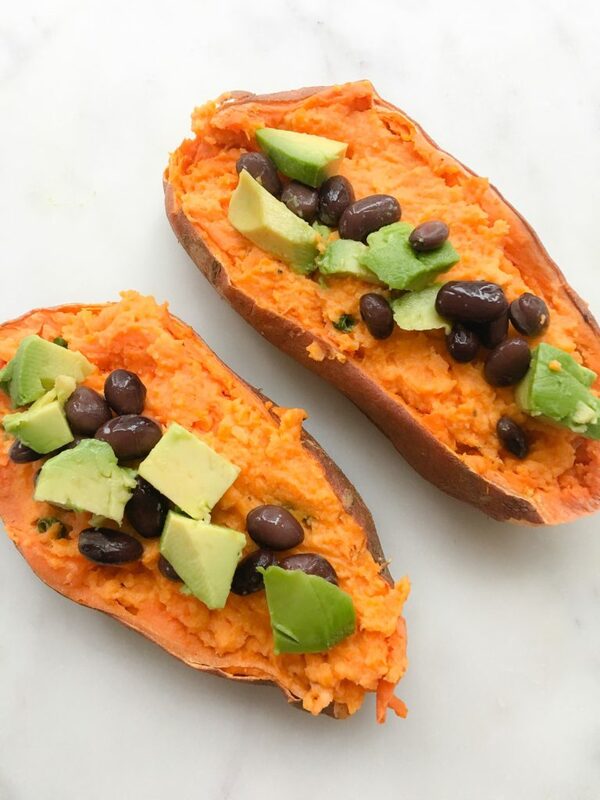 Who doesn’t love a twice baked potato?! While they are super delicious and go really well with a grilled steak I might add, the ingredients can be a little heavy. And I personally don’t do well with a ton of lactose. SO I came up with a simple recipe that uses lighter ingredients to make this fan favorite a bit healthier. And I am posting it right on time for the Super Bowl. Looking for an easy recipe for your Super Bowl party? Look no further. I think it is fair to say the food is a pretty important part of the Super Bowl (well at least for me!). Since it is usually a full day snacking on and off I figured it might be nice to swap in some healthier choices. This one only requires 3 ingredients! Now the great thing about this recipe is that it tastes great with these simple ingredients but you can also mix them up. You can try adding bacon, red peppers or cheese. Pre heat the oven to 350 F. Wash sweet potatoes and scrub off any rough edges. Cut them in half and poke holes in each half with a fork. If you are short on time, pop them in the microwave for 8 minutes. I promise this works just as well as the oven. Once they are done in the microwave (inside should be soft when poked with a fork) scoop out the insides into a bowl and set the skin aside. 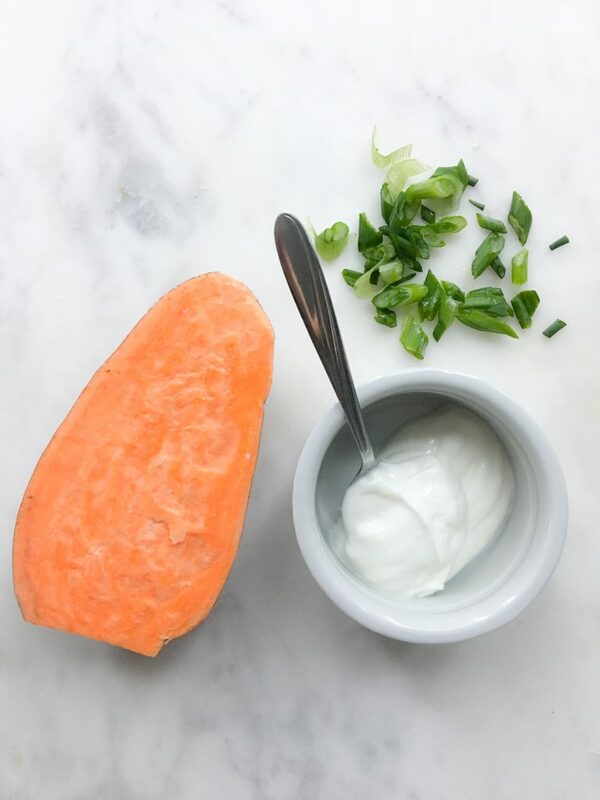 Add the yogurt and diced up green onions to the bowl of sweet potatoes. Add salt and pepper for taste. 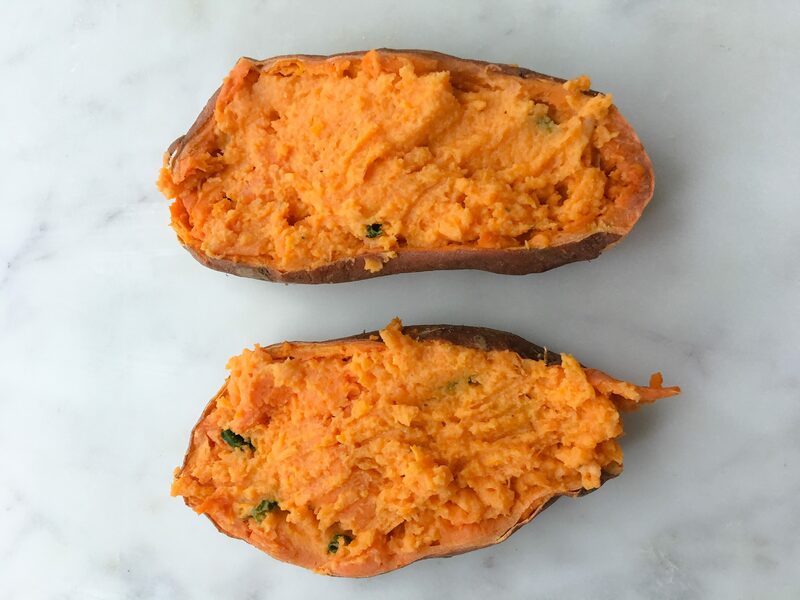 Mix all the ingredients together until well combined – should look like a sweet potato mash. Scoop the mixture back into the skins so they each have the same amount. Pop them back into the oven for 5 minutes and broil for 1-2 minutes to crisp up the top layer. Serve as is or top with avocado & black beans. Alternatively if you have some time, instead of the microwave, you can pop them in the oven for 1 hour and then follow the same directions. But let’s face it who doesn’t want to save some time! And there you have it, an easy, healthy recipe to make for the Super Bowl this weekend. Make sure to grab my recipe for classic chili here – because what’s the Super Bowl without a heaping bowl of chili? !